Vine peach cantaloupe melons (Cucumis melo) are small, peach-sized melons with the creamy texture of a mango, notes Reimer Seeds. Melons ripen in mid- to late summer, depending on planting date. 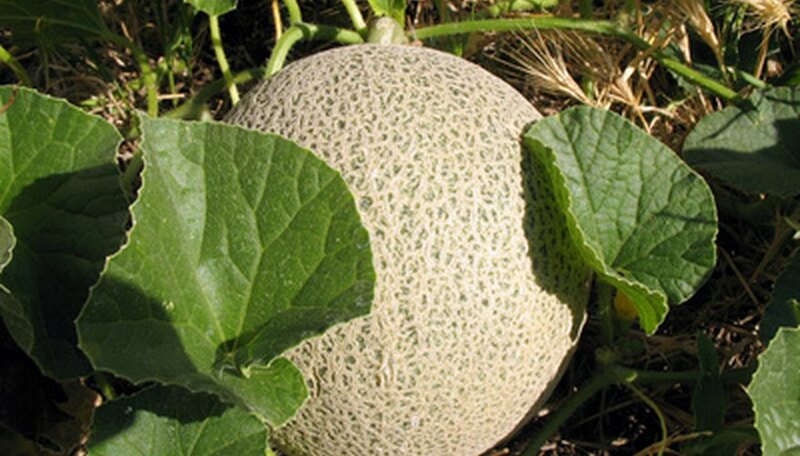 These small melons grow readily from seed and mature within 80 days. Gardeners need a lot of space and full sun to successfully grow melons. The University of Nebraska Lincoln recommends gardeners boost the soil's nutrient content by working compost into the bed before planting melons. To do so, scatter a 2-inch layer of compost over the soil, then turn the compost into the soil with a shovel. Turn the soil to aerate it and remove rocks and weeds from the garden bed. Rake the soil flat again with a shovel. Vine peach cantaloupe seeds require a warm soil to germinate. Wait until the soil warms to 70 to 90 Fahrenheit to plant melon seeds. To test the soil temperature, stick a thermometer into the earth. The University of Minnesota notes the average planting time in that state (when the soil warms enough) is 10 days before the last frost, usually in late May. Sow vine peach cantaloupe seeds directly into the garden bed. Create 1/2- to 1-inch-deep furrows in your garden bed, and space each furrow 5 to 6 feet apart. Sow two to three seeds every 18 to 24 inches. Cover over the furrow with soil to complete planting. Then water the newly planted seeds until they become moist. Melon plants need deep, regular watering. The University of Minnesota advises giving melon plants 1 to 2 inches of water once a week. To determine how much water this is, set a soaker hose on low and run water into a bucket until the water level measures 1 inch. Time this process and water the melons for that amount of time. Melons produce separate male and female flowers; only the female flowers bear melons. They are pollinated by honey bees. Avoid spraying pesticides in your garden or killing bees you encounter, since this could negatively affect the melon crop. Why Do Watermelons Split on the Vine?